I love California strip malls. Well, allow me modify that: strip malls of a particular variety and tone. The sort I’m talking about aren’t populated with dollar stores and sporting goods marts. The sort of strip mall I like functions as a small oasis of excellent Asian food, where multiple Asian restaurants cluster together, seemingly for protection — the equivalent of small natural bastions of biodiversity. The excellent Myung Dong Tofu Cabin sits in one of these Asian food gallerias, next to a Chinese bakery and a pho shop. Owned and operated by a small crew of middle-aged women, the delightfully named Tofu Cabin specializes in Korean home-cooking, with a couple of DIY BBQ tables for those feeling fancy. At this home-cooking — the heart and soul of Korean cuisine, if you ask me – this place absolutely excels. With lower prices by a buck or two than the other Korean restaurants I’ve found in the Peninsula, I believe I’ve found my new standby. I’m usually a bit ambivalent to SoonDooBoo, perhaps because it’s often rather uninspired. 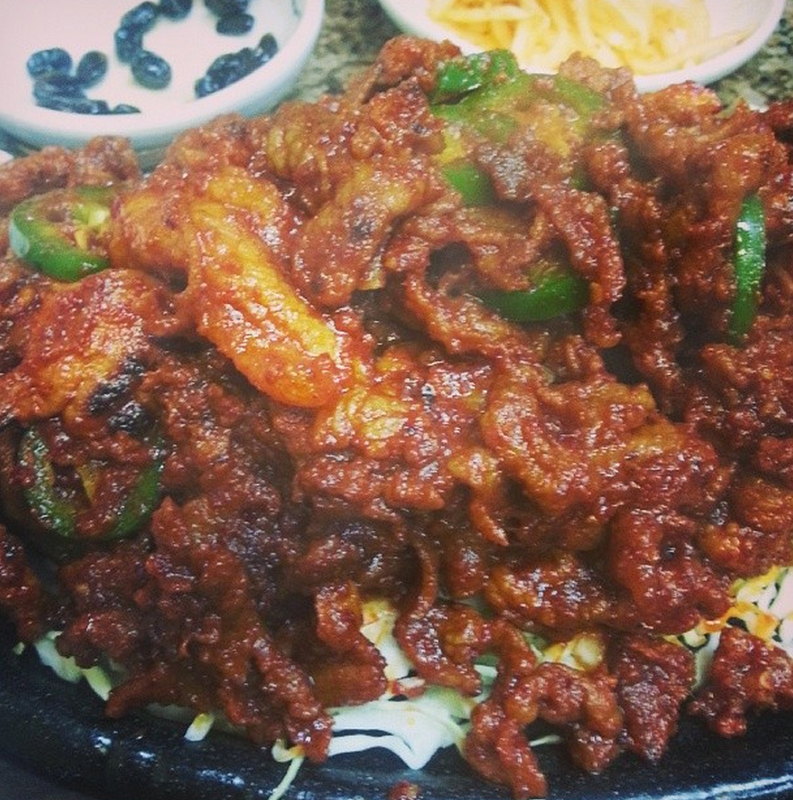 The soondooboo here was a molten, flavorful, slightly creamy brew, with bits of beef. They took us seriously when we said “spicy.” My sinuses were rendered as open as the Panama Canal. Pork BBQ was the right kind of greasy and exceedingly prolific in the full portion, with a potent dose of red pepper and sliced jalapeno. It was particularly good in a fresh lettuce wrap with some kimchi and a bit of hot sauce. Seafood dolsot bibimbap was also excellent, served in a very large black stone cauldron, and filled with shrimp and squid. I was less impressed with the kimchi ji gae (pork and kimchi stew), which definitely featured far more kimchi than it did slices of pork belly. 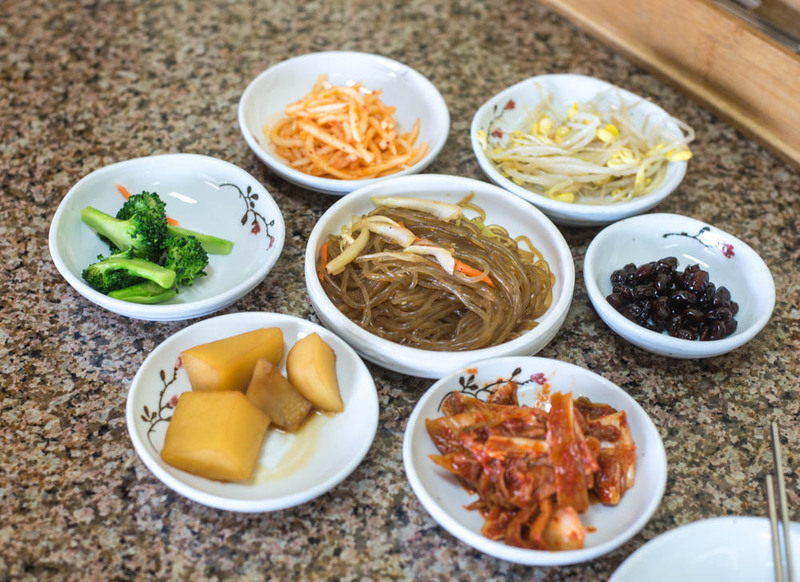 The banchan selection is fresh, if slightly austere, and by austere I think I actually mean “healthy.” (Where’s my mayonnaise drenched noodle salad?) Sweet black beans are a rare site on these spreads in recent years. Still, where’s the tiny fish with equally tiny eyeballs? They defined my childhood. The kimchi is excellent. 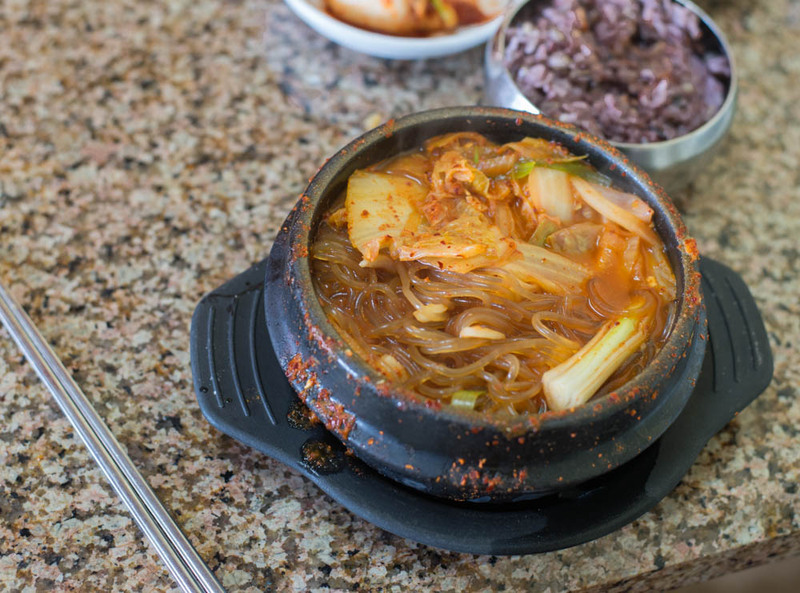 A Korean restaurant rises and falls upon the virtue of its kimchi. Service is friendly and homey, and the food comes out pleasingly quickly. Free green tea and the correct kind of purple rice. I’ll be back, probably over and over and over. Korean food has a peculiar addictive quality for me, a Proustian madeline.